This story begins when I was a child: I was born poor. Often we hadn't enough to eat. Whenever we had some food, Mother often gave me her portion of rice. While she was transferring her rice into my bowl, she would say "Eat this rice, son! I'm not hungry." As I grew, Mother gave up her spare time to fish in a river near our house; she hoped that from the fish she caught, she could give me a little bit more nutritious food for my growth. Once she had caught just two fish, she would make fish soup. While I was eating the soup, mother would sit beside me and eat the what was still left on the bone of the fish I had eaten, My heart was touched when I saw it. Once I gave the other fish to her on my chopstick but she immediately refused it and said, "Eat this fish, son! I don't really like fish." Then, in order to fund my education, Mother went to a Match Factory to bring home some used matchboxes, which she filled with fresh matchsticks. This helped her get some money to cover our needs. One wintry night I awoke to find Mother filling the matchboxes by candlelight. So I said, "Mother, go to sleep; it's late: you can continue working tomorrow morning." Mother smiled and said "Go to sleep, son! I'm not tired." This was Mother's Third Lie. When I had to sit my Final Examination, Mother accompanied me. After dawn, Mother waited for me for hours in the heat of the sun. When the bell rang, I ran to meet her.. Mother embraced me and poured me a glass of tea that she had prepared in a thermos. The tea was not as strong as my Mother's love, Seeing Mother covered with perspiration, I at once gave her my glass and asked her to drink too. Mother said "Drink, son! I'm not thirsty!". After Father's death, Mother had to play the role of a single parent. She held on to her former job; she had to fund our needs alone. Our family's life was more complicated. We suffered from starvation. Seeing our family's condition worsening, my kind Uncle who lived near my house came to help us solve our problems big and small. Our other neighbors saw that we were poverty stricken so they often advised my mother to marry again. But Mother refused to remarry saying "I don't need love." I continued my part-time studies for my Master's Degree. Funded by the American Corporation for which I worked, I succeeded in my studies. With a big jump in my salary, I decided to bring Mother to enjoy life in America but Mother didn't want to bother her son; she said to me "I'm not used to high living." In her dotage, Mother was attacked by cancer and had to be hospitalized. Now living far across the ocean, I went home to visit Mother who was bedridden after an operation. 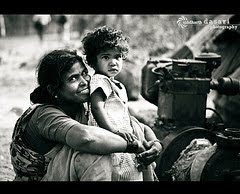 Mother tried to smile but I was heartbroken because she was so thin and feeble but Mother said, "Don't cry, son! I'm not in pain." For those of you who are lucky to be still blessed with your Mom's presence on Earth, this story is beautiful. For those who aren't so blessed, this is even more beautiful. This story was shared to me by a wonderful lady who loves her parents so much. Of the four grown up children, she is the only child who still takes care of her aging parents financially and physically. My dear, you are truly an admirable daughter.